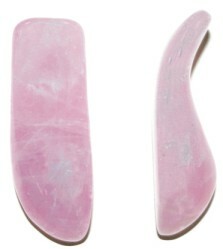 This Gem Stone Tool is cut in a scoop shape which makes it easy to hold plus all sides and ends can be used! It is a favorite with our Therapist. It fits with the natural curve of your hand and lets you apply more pressure without putting stress on your thumb or wrist. Massage Wands can be used for massage therapy, trigger points, reflexology, deep tissue, and much more. When used in the place of your thumb, massage wands relieve pressure so that your hands are not so sore at the end of the day. These Massage Wands are 3" to 3.1/2" long and 1.1/2" to 1.3/4 wide at the biggest end. They are made from precious stones so they carry the energy of each stone and can be heated or cooled.